Street food specialist KERB is now 5 years old - that's 5 years of lunchtime markets and special events, and 5 years of giving a start to some of London's biggest street food names, like Club Mexicana, Oh My Dog, and Capish. 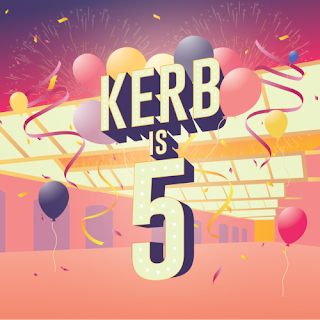 To celebrate they're holding a 5th Birthday party in King's Cross, on Friday 20th and Saturday 21st October, with special 'KERBlaboration' dishes prices at just a fiver. I've listed them all below; my picks would be Bleecker x Bao, The Ribman x Oh My Dog, and Club Mexicana x Dosa Deli. It's a ticketed event - tickets are a fiver + fees - and it will sell out, so make sure you get your tickets! "KERB’s big 0-5! Every year we’ve celebrated our birthday party under the canopy at King’s Cross. It’s where we started and where we love to come back to, bringing traders new and old together for a big old knees-up. Nonna’s x Capish: Neapolitan choc ice station"